June and July have been very busy for us, but not busy at the acid bench or microscope. Now we're back in the lab and getting down to business, knocking a few chips off the top of the amazing pile of historic devices we've received from donors lately. 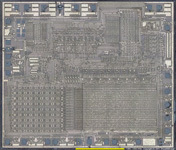 Here's a very early microcontroller from TI. Keep an eye on our Chip Status List.